You may have noticed long icicles hanging from your gutters, but you may not have realized the significance of the damage they cause. 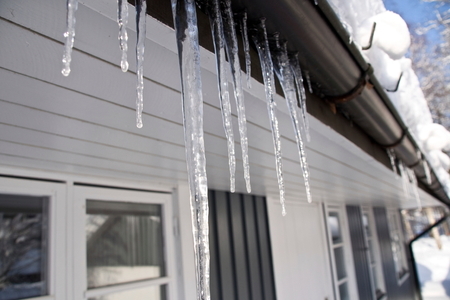 Icicles are one of the first warning signs of ice dams on your roof. Read on to discover what ice dams are, how they form and the best methods for removing them safely. An ice dam is a wall of ice that forms at the edge of the roof, usually at the gutters or soffit, with water pooling behind it. This water has the potential to leak into your home and cause damage to walls, ceilings, insulation and other areas. Ice dams are caused by the combination of heavy snowfall and improper attic ventilation. Poor ventilation can lead to an uneven distribution of warmth in your attic that causes snow on your roof to melt unevenly, even when the outside temperature is well below freezing. When the first layer of snow on your roof starts melting, it runs down your roof underneath colder layers until it reaches an unwarmed section like soffits, valleys or gutters. It then begins to freeze again. This process of thawing and refreezing is what causes an ice dam. If you don’t have the know-how, removing an ice dam can be quite dangerous. In the past it was common practice to pull the gutters off the house, which was well intended, but wrong. Removing gutters caused significant damage to roofing and guttering systems, and then when the snow melted it dropped next to the house’s foundation and even caused basements to flood. Note that ice dam removal can risk severe personal injury and damage to the roof if not done properly. Never walk on a snow-covered roof and make sure if you’re using a ladder that you follow the proper safety procedures. Removing snow from the roof will eliminate the main ingredient necessary for the formation of another ice dam. Using a roof rake and push broom, remove the snow by carefully pulling it down the slope of the roof line. (Never pull snow horiziontally across the roof or it may break off the shingles and cause other damage.) Then, carefully chip away a channel through the ice dam so the water will be able to flow through. Make sure you stop the channel when you get close to the roofing. It’s not necessary to remove all of the ice in the gutters or the ice dam itself — if you remove the snow from the roof, the ice will melt as the temperature rises. Cleaning the gutters on your home can prevent ice dams from occurring quickly, but it is not a complete solution. Gutters will take on the outside temperature and in some cases will be full of frozen debris, causing the melted water to refreeze when flowing into the gutters. Proper attic ventilation and insulation is the best way to prevent ice dams. The usual recommendation for proper ventilation is 1 square foot of vent for every 150 feet of attic floor area, but each climate and region may have its own recommendations so contact a licensed local insulation company near you for exact numbers. If you have small louvered vents (also known as gable vents) at either end of the attic, you can either replace them with larger vents or install an electric vent fan over the inside of them. These special fans usually work on a thermostat and will pull outside air into the attic to keep the temperature inside consistent, thus preventing the uneven melting and refreezing of snow and ice.